Glutamine plays a pivotal role in protein synthesis and therefore in building those all-important muscles. It’s important for a healthy metabolism and supports the growth of new muscle. Your immune system also needs glutamine to operate optimally and to provide your body with all of the protection that it needs. The sad truth is that while building your muscles through training, you’re slowly depleting the glutamine levels in your body. Luckily, FA Nutrition Gluta Core is here to help! This supplement will ensure that your body always has the right levels of glutamine to prevent muscle catabolism and to ensure that your immune system stays healthy during your training. It’s main ingredient, l-citrulline, provides an increase in energy and also improves stamina, endurance and performance. It also increases the levels of nitric oxide in your body, which in turn allows nutrients and oxygen to be delivered to your muscles. The second main ingredient is N-acetyl-L-glutamine, which also delivers much-needed glutamine to your body. L-glutamine Alpha-ketoglutarate is the third core component, and it is an acid that when is combined with L-glutamine increases the muscle growth potential. The last essential ingredient is taurine. This component can help fighting fatigue, free radicals and metabolizing energy. Not only will your levels of glutamine be where they should, you’ll also be experiencing all of the benefits of these ingredients! You can take it before and after your workout to replenish your system with any nutrients lost while exercising. It’s the ideal supplement to provide you with awesome results! Have a question about Gluta Core? What is it, what does it do, how and when to use or something else? Ask us. 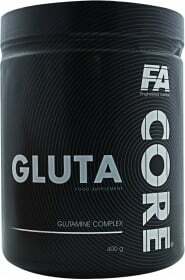 WARNINGS Gluta Core : Do not exceed recommended daily dosage! Do not use if you are allergic to any ingredient in this product. Do not use if pregnant or lactating. Food supplements should not be used as a substitute for a varied and balanced diet. Keep out of reach of children. Store in a cool dry place away from direct sunlight.